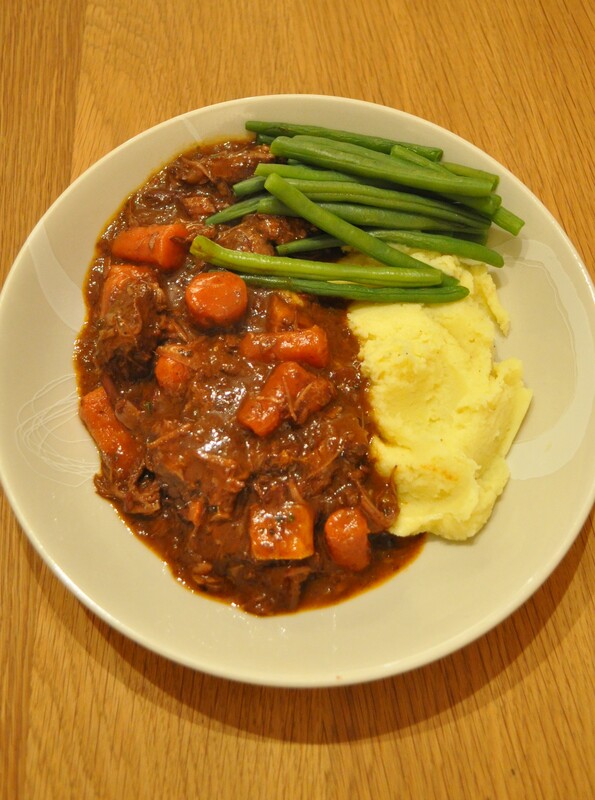 This stew is another great winter dish. It is inspired by a Jamie Oliver recipe but I had to make my own tweaks to it. I mean, there was no bacon in the original recipe! The beauty of this kind of dish is that you can adapt it to your own tastes. You can really add any root vegetable to it. Sometimes I roast the butternut squash before adding it for a different flavour. It breaks down into the sauce slightly and thickens it. You could also put some potatoes directly into the stew and serve it in a bowl with some bread and salad. I prefer to serve it with creamy mash for ultimate comfort food and some steamed green beans or broccoli for freshness. I know a lot of recipes say to brown the beef first, but Jamie took the hard work out of this and said it is just as good without the extra effort. Who am I to argue? I use shoulder of beef in stews; it slow cooks beautifully and falls apart when the stew is done. Make sure to use a bottle of wine that you would actually drink. Then drink the rest with the stew! This is another dish that tastes good the day after you make it and freezes really well. Preheat your oven to 160C/140C fan/gas mark 2. Put a little oil and the butter into a casserole dish and heat over a medium-high heat. Adding the oil with the butter will stop it from burning. Add your onion and bacon and fry until the onions softens and the bacon browns. Add the sage leaves and garlic and fry for a further minute. Season the flour with the salt and pepper and toss the meat in the flour until it is lightly dusted. Add to the dish. Add all of your vegetables, tomato purée, wine, stock and bay leaves and gently stir together. Season generously with freshly ground black pepper and a little salt, remember the bacon will be salty. Bring to the boil, place a lid on top, then cook in the preheated oven until the meat is tender. How long this takes depends on the cut of meat you are using and how large the cubes of beef are. The best way to test is to break the a piece of the meat with a fork and if it falls apart easily, it’s ready. It usually takes 3 hours in my oven. I like to add the finely grated lemon zest and the rosemary and stir through before serving; it gives the dish a great lift. My chief taster doesn’t like this so I serve his and then add it to the rest of the stew. Taste to see if it needs more seasoning. Remove the bay leaves before serving. I’ve made that before, and I loved it! But I’ll have to try it again with your tweeks. And it’s just the weather for it! Perfect weather for it, let me know how you get on!